Temitope Adebamiro has been charged with first-degree murder in the stabbing death of her husband, Adeyinka Adebamiro. Police were called to the Delaware home of a couple after an argument between the two turned violent. By the time authorities arrived, they found 37-year-old Adeyinka Adebamiro unconscious on the floor suffering from a stab wound to the upper body. Paramedics pronounced him dead shortly after their arrival. Court documents viewed by the News Journal did not state how old the nanny’s daughter was, but alleged that Adeyinka Adebamiro carried on several affairs with different woman and sent his wife to Nigeria so that he could spend Christmas with the nanny’s daughter, who was not named. The documents also allege that Adeyinka Adebamiro abused his wife of 10 years, including reportedly assaulting her during both of her pregnancies with their two children. Temitope Adebamiro reportedly used her phone to take photos of several inappropriate text-message conversations, as well as illicit photos, between Adeyinka Adebamiro and her sister and the nanny’s daughter. 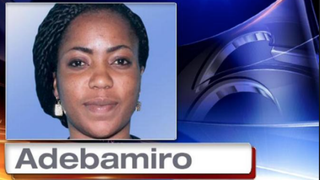 The night before Adeyinka Adebamiro would be found dead, the couple began arguing when he found the images his wife had taken with her phone, the News Journal reports. Adeyinka Adebamiro reportedly took his wife’s phone and began deleting the photos. Temitope Adebamiro claims in the court documents viewed by the News Journal that during the argument, the power went out and she hid in the kitchen waiting for the power to return. According to the News Journal, police investigators learned that there was no power outage in the area at the time Temitope Adebamiro mentioned. Temitope Adebamiro also claimed that when the power returned, her husband had been stabbed and a bloody knife lay on the floor. The story changed several times, according to the News Journal, which reported that another version of the husband’s death included his wife’s claim that he had stabbed himself. “Temitope was charged with first-degree murder and other charges. She was arraigned and committed to the Baylor Women’s Correctional Institution, where she is being held without bail,” the News Journal reports. Read more at the Delaware Online News Journal.